has been working for more than 100 years to find a cure for cancer and to help patients fight back, get well and stay well. Today, the Society uses a number of websites and mobile apps to provide information on cancer detection and treatment, offer volunteer opportunities, and accept donations. The Society knew they were being visited by users with different needs and goals, but it was a challenge to isolate these customer segments and to help them achieve their goals. The Society also wanted to address concerns with the Google Analytics implementation on its sites, monitor how its users changed behavior over time, and remarket to all segments once they were identified. In order to find the data and insights necessary to answer the challenges above, the Society partnered with Search Discovery, a Google Analytics Certified Partner. To achieve these goals, they analyzed the website user segments and created personas to represent them. 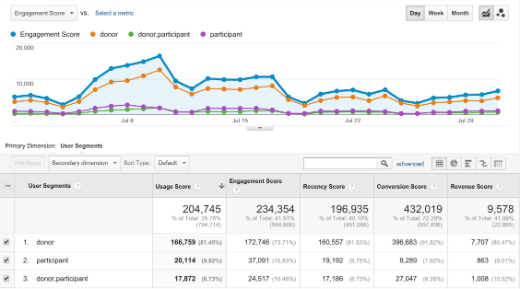 Then, they used segmentation and custom metrics to score each group based on how it was behaving on the website. To learn how the American Cancer Society and Search Discovery worked together to implement a process to understand, optimize and monitor the overall health of the site for each user segment, download the detailed case study. And if you want to help saving lives, donate today. The American Cancer Society has been working for more than 100 years to find a cure for cancer and to help patients fight back, get well and stay well. Today, the Society uses a number of websites and mobile apps to provide information on cancer detection and treatment, offer volunteer opportunities, and accept donations.